Over the course of time, it’s inevitable that your garage door will need to be repaired. It’s a complex piece of machinery, and there’s plenty that can go wrong; from extension springs snapping to openers wearing out and cables coming off the drum. Our technicians are on hand to help you prevent accidents from occurring and to address issues as they arise. One of the most common problems that overhead doors encounter is a broken spring. These springs are critical for the operation of your door system, since they bear the weight of the door. If they break, they need to be replaced as quickly as possible in order to restore functionality. They’re usually fitted in pairs in order to maintain balance. If you replace them at different times, you'll likely have to deal with an unbalanced door with one loose spring that will need to be replaced in the near future anyway. It’s vital you don’t try to handle these springs on your own, since the tension built up in these components can be dangerous if improperly released. The most complex part of your automatic overhead door system is the opener. This is the unit that controls the door’s automatic movement, and is usually the only electrical component in the system. Since it is made up of quite a few components, it can develop numerous problems; wiring can become frayed and damaged, limit switches can be knocked out of position and safety sensors can become misaligned. Our technicians can swiftly identify any such issues, and fix anything from motor gears to circuit boards. 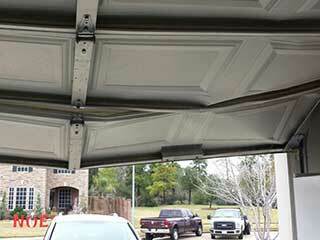 Garage door panels can become damaged more easily than you might imagine. Our technicians can repair and replace panels from a wide variety of different manufacturers, including Amarr, Clopay and Windsor. Whether you need a few dents removed, or a whole new panel inserted, we can get the job done. Our professionals can solve any problem that is affecting your door’s functionality. Contact us at Garage Door Repair Ramona today to schedule an appointment.